By winning the super-G at the 2009 world championships, Swiss veteran Didier Cuche finally won a gold medal at the ripe old age of 34 years, 5 months and 21 days, making him the oldest ever Alpine world champion. But it is perhaps what happened three days earlier, defying fog to come within 4/100ths of a second of the downhill gold, taking silver, which defines his beleaguered career. A tough steely-eyed former butcher with a prominent jaw, Cuche told journalists after his victory of the frustration from a career of near misses: "When you win you're the hero but end up on a lower step of the podium and the media treat you as a second class citizen". Cuche suffered typical agony during the 2008 World Cup. Needing a single point from the final race to claim the super-G crystal globe, he raced for the point, misjudging it and came 16th, out of the points, while his rival won and claimed the title by one point! He described himself as "The idiot on the mountain." He did however win the giant slalom title in 2009, a newish discipline for him as he works to expand his chances for the overall World Cup title, after finishing third in 2002, 2007, 2008 and 2009. 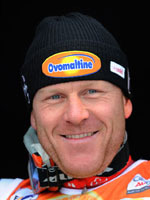 On the brighter side he has two further crystal globes after winning the downhill crowns in 2007 and 2008 a discipline in which he excels. Unusually for a top Swiss Alpine skier, Cuche is a native of thr Jura, better known for its Nordic disciplines, but he was discovered and nurtured by national coach Patrice Morisod. Injuries have blighted his career - he tore knee ligaments during a downhill race in 1995 - and he regained fitness only to break his leg in training the following year. On top form during the 2004-05 season he tore knee ligaments in training in Adelboden on January 4, 2005 and was ruled out for the season. This would explain Cuche's meagre Olympic harvest with just a super-G silver from Nagano to his name. He backfired at the 2002 Winter Games in Salt Lake City, coming 10th in the giant slalom, a distant 14th in the downhill and was disqualified in the super-G. This was a huge disappointment for Cuche, who had hoped to capitalize on his spectacular silver medal at the Nagano Games in 1998 when he finished behind Austrian ace Herman Maier in the super-G.
Cuche was ecstatic and literally danced for joy. The Vancouver Games in 2010 will be a real Indian Summer for the veteran, a last chance saloon for a brave battler who has never given up and may just yet fullfil his Olympic dream on the West Coast of Canada.